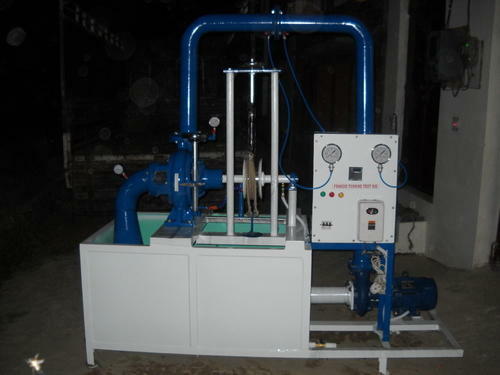 Being an illustrious Supplier of Francis Turbine Test Rig, we endeavor to achieve 100% customer satisfaction. With our inventory management system, we are capable to undertake urgent and massive requirements of the buyers at a time. This Francis Turbine Test Rig I00mm size to develop 2 HP at 1250 RPM with a flow of about 1400 Ipm at 15 meters supply head. Supply pump set lOOxlOOmm size, 1500 Ipm at 15 meter head suitable for supplying water to the above turbine. MS Tank to store sufficient water for independent circulation through the unit experimentation and arrange Within the floor space of main unit. Capacity 650 Itr. Rope Bake Dynamometer is used to measure the output. Spring balance and dead weights are used to measure the load. Discharge Butter Fly valve used to control the flow rate of water. Pressure Gauge of 4.2 kg/cm2 is used to measure the pressure head. Rigid MS frame work compactly fitted with all the above items as a self-sufficient package unit suitable for operation without any foundation. Switch and starter suitable for above motor pump set mounted on the control panel board.